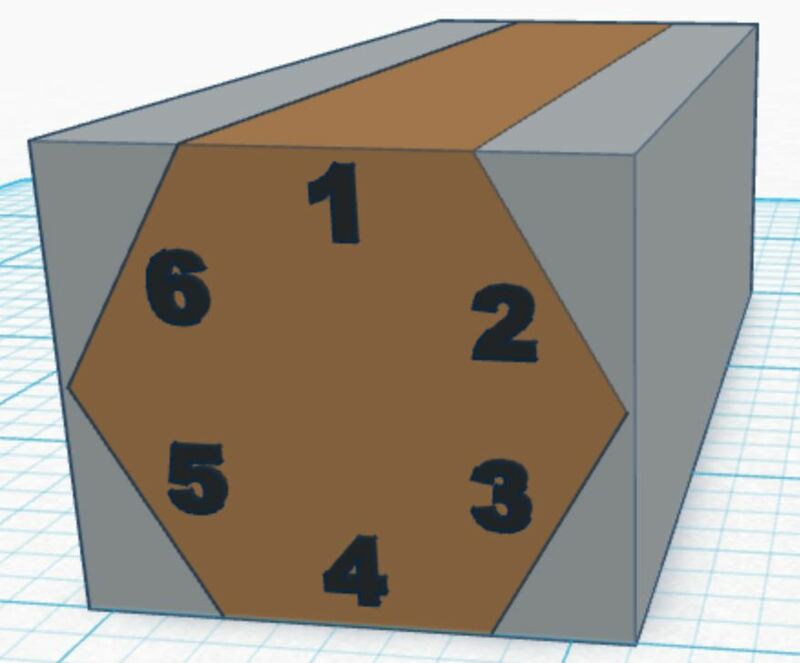 Felix Enterprises' Woodworking Projects: Hexagons, Part 2 - The project and some math! As I've mentioned elsewhere, my wife paints little plastic and metal figures. Her work area is a folding table that has seen better days. She's also acquired a bunch of materials that are stored in bins that are stacked around the desk. I want to build her a new painting table that includes storage for her paints, brushes and other materials. The focal point will be the top which will be a maple and walnut hex pattern mimicking gaming maps. Yup, the first step is to make some decisions. I already know I want a thin border of walnut around my maple hexes so that decision is already made for me. The next decision I need to make is the size of the hexagon. If I was making a gaming map I'd make the hexes 1 inch because that's the most common size. However, since this table is going to be used as a hobby workbench and not a gaming table I can make the hexes bigger which will result in fewer pieces so I'll look at making 1 1/2 inch hexes too. I'm going to build my top as a 1 inch thick butcher block (end grain on top) like in Figure 1 below. As Jack Burton says in Big Trouble in Little China, "This is going to take some crackerjack timing, Wang." In this case it is going to take some crackerjack setup. One trick to precision is to not change the settings on the tools in the middle of the process because they'll never go back to the exact same spot and tiny errors accumulate. Since I cannot go back and make more hexagons if I run short, I want to make sure I have all the material I'll need for the table and then a little more for tests and waste. To figure out how much wood I need I could try to just calculate the total board feet of the completed table top; however, my process for making the hexagons creates a fair bit of waste so I need to take that into account. My basic process will be to calculate the number of hexagons I'd need to fill the surface of the table, then multiply that times the length of each hexagonal block plus some for waste. My plan for the table gives it a top surface area of 30 in x 60 in = 1800 in2. A hexagon with a height of 1 inch has an area of 0.866 in2. That works out to about 2100 pieces to glue up into the table top. Yikes! A hexagon with a height of 1 1/2 inch has an area of about 1.95 in2. For my table top that works out to about 925 pieces. That would be a lot less daunting. I think I'll go with 1 1/2 inch hexes. How did I figure out the area of a hexagon? I'd like to say I remembered my geometry; but, that wouldn't be true. I'd like to say I figured it out the hard way by breaking the hexagon into a square and some triangles; however, that wouldn't be true either. In actual fact I used a web application that did the math for me. Since 1.5" high hexes look like the winner I know I'm going to need 925 hexagonal pieces 1 inch long (the thickness of the table top). I also need to calculate the waste for the width of the saw blade when I separate the pieces from the column. For a small number of cuts it probably wouldn't make that much difference but I'm going to be making over 900. My saw blade is about 1/8 inch in width so each little hex block is going to require 1 inch plus the 1/8 inch saw blade kerf. This is a bit easier to calculate. I need 925 pieces that are effectively 1 1/8 inches in length which comes to 1050 inches. I may as well do my waste calculation now too and add 30% more for waste which brings my total length to 1365 inches or about 115 feet. My process for cutting a hexagonal column involves first cutting a rectangular blank and then clipping the corners. To figure out the size of the blank I need to know both the height of the hexagon and the diagonal. For a 1 1/2 inch high hex the diagonal is just under 1 3/4 inch. Figure 2 shows how I'll get a hex out of a rectangular block. It is basically just a process of removing the wood shown in grey. Twenty five board feet at current rates for maple ($6.40/bf) is going to cost me around $160. Making custom furniture isn't cheap. Figuring out the amount of walnut needed is quite a bit easier. My final walnut border around each hex is going to be between 1/32 inch and 1/16 inch but I'll probably make my walnut strips by ripping 1/8" strips from a board that is thicker than the length of the side of the hexagon. I got the length of the side of the hexagon from my calculations above and for a 1 1/2 inch hexagon it is 0.866 inch. I'm thinking if I can buy a 5/4 rough walnut board the strips I rip off it will be plenty wide. I'll need six strips - one for each side - as long as my hexagonal maple column [ 1365 in ]. I'll probably actually rip the strips a little thinner than 1/8 inch but that works well for rough calculations. I also need to figure in waste from the saw blade kerf which is another 1/8 inch. I'll need 30% waste here too so that works out to 2665 in2 or 24 bf of 5/4 walnut. At current rates ($9.95) it is going to cost me $230. Yeash... could be worse... Wenge is going for almost twice that. I've done a lot of calculations but thankfully my shopping list is going to be much simpler. I know I need 114 linear feet of maple that is 1 1/2 inches by 1 3/4 inches. The easiest way to get that is to buy 8/4 maple and rip it into 1 3/4 inch wide blanks. This simplifies things because I know I can get a blank out of every 2 inches of width so if a board is 6" wide I'll get three rough blanks out of it. If the board is twelve feet long that means I'd be getting 36 linear feet of maple blanks out of that 6" wide board. My walnut strips are going to be ripped out of a 5/4 board 1/8 inch thick. This is going to be the same kind of calculation above. I can get one strip for every 1/4 wide the board is. I need six times the length of the maple which means I need about 684 linear feet of strips. If I get a six inch wide board that is twelve feet long I'll get 288 linear feet of walnut strips. 8/4 maple - 114 feet x 2"
5/4 walnut - 684 feet x 1/4"
That was a lot of work but at least I know how much it's going to cost me and how much maple and walnut I need to buy.